Pegasystems was named as a Visionary in Gartner’s 2019 Magic Quadrant for Multichannel Marketing Hubs. According to Gartner, "MMH vendors are facilitating unified customer profiles, strengthening machine learning and delivering insights to drive relevant interactions in real time." For the MMH Gartner evaluates Pegasystems and places them in the Visionary Quadrant. According to Gartner, "Visionaries provide a strong vision for the multichannel marketing market or excel in advanced or emerging areas. These include customer data platforms and artificial intelligence, identity resolutions, multidimensional segmentation, mobile marketing, loyalty marketing and social marketing, and real-time interaction management. They can set strategic direction or demonstrate specific innovative capabilities in one (or more) functional area (such as advanced campaign functionality or digital marketing integration) in multichannel marketing that the market will eventually adopt. Visionaries may have multichannel marketing implementations from different buying centers, such as customer service or digital commerce." Pega's strategy for multichannel marketing implementations is centered around 1-to-1 customer engagement. Our real-time, omnichannel AI capabilities allow organizations to provide their customers with the next best action, based on context, every time they engage. About the research: Gartner does not endorse any vendor, product or service depicted in its research publications, and does not advise technology users to select only those vendors with the highest ratings. Gartner research publications consist of the opinions of Gartner's research organization and should not be construed as statements of fact. Gartner disclaims all warranties, expressed or implied, with respect to this research, including any warranties of merchantability or fitness for a particular purpose. 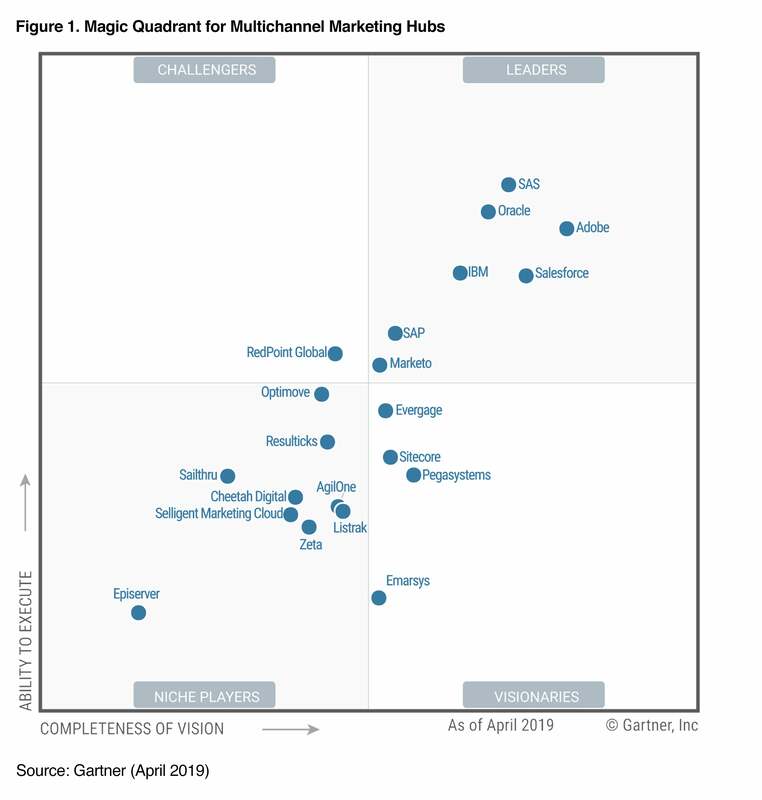 Magic Quadrant for Multichannel Marketing Hubs, Noah Elkin, Adam Sarner, Benjamin Bloom, Joseph Enever, Colin Reid, 18 April 2019. This graphic was published by Gartner, Inc. as part of a larger research document and should be evaluated in the context of the entire document. The Gartner document is available upon request from Pegasystems.